Before you resign yourself to getting off your property and out of your yard, you might consider giving it a little TLC. It can be a worthwhile investment, particularly if you’re going to have more children. The thing about a kids’ swing set that makes dealing with it difficult, is it’s not much different from dealing with old fitness equipment — practically no demand. And, if you don’t want to repurpose parts of it for other uses, you’ll still have a huge item to deal with. This is especially challenging for parents with children who are growing out of a swing set. They’re getting too old (or at least have the perception that it’s for younger kids) and this means you’ll have to dispose of it somehow. Now, this begs the question as to how to deal with a kids’ swing set.You can sell it online locally or give it to a neighbor. Another option (if you’re selling), is to let it go with the house. Or, donate it to a local school or church. Remove the accessories. If there are any little parts, like a toy telescope or other embellishments, take these off first. Put them aside, out of the way so you don’t trip over them as you work. Take the swing(s) off the frame. The first thing you’ll need to do is to remove the swing(s) from the frame. Put these aside so they aren’t a tripping hazard. Place any loose hardware in a plastic bag to keep it organized and together. Dismantle the entire frame. Now, take apart the frame itself using a drill-driver and/or ratchet. Exercise caution as these support parts are heavy and awkward to work with. Create separate piles for separate construction materials. Put the wood in one pile, the metal in another, the plastic in another, and the composite parts in another pile. 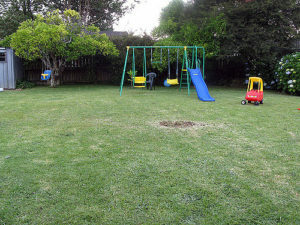 If you need help with swing set removal and disposal, just phone 800-433-1094 or visit Junk Garbage Removal.